product reviews from a quad mom named suz: JUST SAY "NO" to Mom Jeans! JUST SAY "NO" to Mom Jeans! I love them all but my favorite is the casual holiday. I'm all about comfort with style! This is a compensated review by BlogHer and Loft. I must admit, when I heard that I would be trying on clothes at LOFT (used to be Ann Taylor LOFT)...I didn't fully understand the differences between Ann Taylor and the newer division company: LOFT. HOW HAVE I NEVER WALKED INTO THIS STORE BEFORE?!?! It was love at first sight! When discussing age-appropriate apparel, my friends and I often talk about how we are "stuck"...you know, stuck in between a "teenybopper" and a middle-aged mom. It is a common conversation among women my age (29 & knockin' on thirty's door), am I right? (thank you, Bret! ), and a very talented professional photographer (thank you, Heather!). We were given 45 minutes to complete a “Style Challenge”--where we put together three perfect holiday looks from LOFT: the perfect party outfit, an office-to-party outfit, and a casual holiday look. Here are pics from my very own, SUPER fun, LOFT SHOPPING PARTAAAY! Perusing the aisles before we begin--SO many cute things to choose from! Trying to find the perfect combination...Modern Boot light wash jean with a swirl appliqué T-shirt and toggle-button sweater coat. Look #1: Casual Holiday...a laid back look that will keep you cozy and cute during your downtime this holiday. Black cords paired with a chiffon blouse, complete with a stylish gray sweater coat and long fringe necklace. Look #2: Office-to-Party...a versatile look that you can transform from office-appropriate to party-ready in no time! Cuffed, wool striped trouser pants with a cascading ruffle blouse and soft velveteen blazer. Lets not forget the SUPER cute bauble necklace! (They have THE BEST accessories! I was in heaven.) I LOVED the royal blue shirt paired with the long magenta beads. I'm all about colors that POP! Look #3: Perfect Party Outfit...from low-key style to full-on glamour, an outfit that will make you shine at any get-together. A beautiful party dress with an iridescent sheen paired with a long knotted rope necklace. Simple and smashing! Okay--now down to business...what to purchase?! My dressing room was filled to the brim with layer after layer of adorable clothing & accessories! I hear great things about LOFT denim- so I enlisted the help of my uber-fashion-extraordinaire stylist to find me a pair of skinny jeans that I could wear with my (previously purchased from another store) boots. I am TERRIFIED of skinny jeans, but LOVE the boots-over-jeans look that is so hot right now. (yes, I just used the phrase "so hot right now"). Here's what we put together! I LOOOOVE them! Bret made me a believer. SOOOO...What did I make it home with??? The adorable gray sweater coat and the Modern Skinny dark wash jean (Regular, Size 6). The store at NorthPark in Dallas, TX was well organized and easy to maneuver with super friendly and accessible staff members. 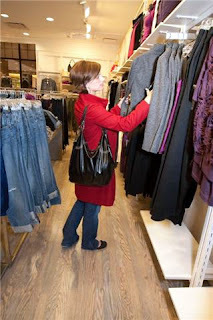 You can find LOFT stores inside a mall or outside shopping center (Click HERE for a store locator). They have special store events like last Saturday-there was a live DJ playing, the atmosphere was fun and relaxing--just an all around great experience. Did I mention there were free snacks and drinks on this particular day? I was comfortable and did not feel out of place---you know, like at those teenybopper stores where you are the oldest person in there? Yah- not the case at LOFT! Trendy. Casual. Fun! I texted my hubby & several friends on the way home and told them that I just found my new favorite place to shop--(no lie!) If you are looking for fun and flirty---LOFT has it. If you are looking for classy business attire---LOFT has it. If you are looking for casual and comfy---LOFT has it. And the greatest part about it- is that you can mix and match everything! Such a versatile collection of cute, affordable clothing---exactly what I'm looking for in this economy. I also love their easy-to-use online website. If you want a quick way to check out some of their styles, click on "Looks We Love" ...its like having your own personal stylist right there in the computer! See below for an exclusive coupon before you start shopping! JUST SAY NO- to "Mom Jeans"! LOFT recently re-tooled all of their denim fits and washes to make them a perfect fit at a remarkable value. I 100%, absolutely found this to be true with my experience. The two jeans that I tried on, I purchased (MODERN BOOT & MODERN SKINNY). I didn't have to size swap--I knew my size, tried on my size, and was ready to go! Which is SO nice and time efficient. Their jeans average around $59- which I think is affordable for the quality of the denim. Some of my closest friends and family are short in stature and it is challenging to find appropriate fitting clothes (pants especially). The fact that LOFT has an entire section devoted to their petite collection shows just how much they try to cater to all body types. LOFT has provided an exclusive coupon to BlogHer and our blogger readers to shop in-store nationwide. CLICK HERE for coupon, valid through 12/31/09. WIN A $200 LOFT gift card! Tell me your favorite LOFT look, out of the 3 outfits we pulled together, and you will be entered to win a $200 LOFT gift card! Just leave a comment below. The contest will begin at 12/10/2009 and will end 12/25/2009. Make sure that the e-mail address you leave is correct. You may receive an additional entry by linking on twitter and leaving a link in the comments. You may receive an additional entry by blogging about this contest and leaving a link in the comments. Thank you SOOOOO much BlogHer and LOFT! I had an absolute BLAST with this review (and Bret & Heather!) ---SO much fun! And to all of you blogger buddies: Happy Holidays and Happy Shopping!!! DON'T FORGET YOUR LOFT COUPON!!! I like the office to party. I have been trying to get into the Northpark store but it is impossible with the kids because all they want to do is see Santa. I love the office to party look, outfit #2. You are much braver then me to try the skinny jeans. They look GREAT on you. I absolutely loved the office to party look. I just found the loft my self and it truly my FAVORITE Place to shop!!!!!!!! I LOVE the casual holiday #1. That is perfect for a mom. It is nice for taking care of the kiddos. You can go to the park and go to a nice restaurant all in the same outfit. I love that versatility.I went on their website, alot of cute clothes. I made sure I printed out the coupon. I like the office to party look!! I'm never thought about shopping here, but I'm going this weekend!!!! I love outfit number 2, but I'd definitely buy outfit number 1 too! I'm all about the day-to-day comfort and looking cute! Love the office to party! ...and I've always assumed Loft was for my mom too! Outfit #2 was my favorite!!! You look so chic in it! I love the Casual Holiday Outfit #1!! So cute!! I love the Loft, they always have such good prices and cute clothes! I blogged about this on my blog. Office to party!! I L.O.V.E. The Loft so much. So glad you discovered it and love it now, too! You look fantastic! Glad you had fun! I love the office to party look. LOFT is one of my absolute favorite stores! I almost jumped out of my chair when I saw you were reviewing my alltime favorite store in the universe!! I am so excited you've been introduced to LOFT!! It is my go-to store and I so appreciate that the prices are very reasonable. Don't ever forget to check out the $4.88 rack, they almost always have one with great tops, skirts, etc. that are only a season behind, so you can grab them for next year or wear them under sweaters, etc. SUCH a great deal! And so fun to see my favorite blogger loving my favorite store! My favorite outfit for you is the office to party look. Though I love the sweater coat, too, but the whole look of #2 is great. I love outfit number 2!! The blazer is my favorite! I can't wait to go try some of their skinny jeans! What a great find. I like outfit #2. I'm always in the market for a nice office look! Oops, crud! Forgot to include my email: christinambw@gmail.com. I honestly LOVE them all! If I have to pick just one, I would pick the work to office look. 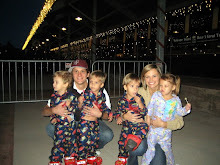 I am excited because I am pregnant with Baby #2 and the LOFT now has maternity! I love # 1 and # 2 but I would say # 2 is my favorite!! 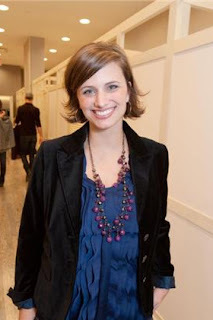 I love Ann Taylor Loft this is a wonderful giveaway!!! Just love it... And you look great in the skiny jeans. I so like the Casual Holiday look. It all looks great and comfortable. I love, love, LOVE that purple dress!!!! its fantastic! The perfect party outfit is PERFECT! Love the dress and necklace! I love the holiday look. Purple is a great color on you! Size 6 after 4 kids too! Good job! I am loving the office to party look. It would definitely fit my lifestyle and get me out of my mommy clothes rut. i love them all, but the dress was TOO CUTE!!! I love to shop at the Loft! I am all about the Casual Holiday. Got to Love comfortable sweaters. I love the holiday casual! I like the casual holiday look best. It's the one I'm most likely to wear! I love the perfect party outfit! I need a dress for a Christmas wedding and that would be perfect! I love the casual holiday look...love the gray sweater! I love the outfit #2 OFFICE TO PARTY!! I am a teacher in Southlake and I LOVE LOVE LOVE the LOFT! They have discounts for teachers and great sales, prices and style. I feel cute for work, but can use the pieces for casual looks on the weekends. Okay enough of that...I loved your office party look #2. So CUTE! I love them all, but outfit #2 was my favorite as I often leave my office to go straight to party - and having to stop to change is just a drag! 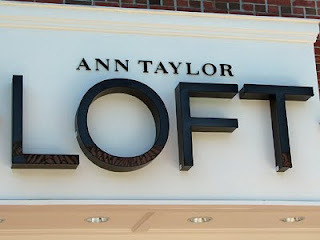 I haven't every been brave enough to try Ann Taylor or Loft, but I will definitely be checking it out soon! And ps - the skinny jean/boot outfit was WAAAYYYY cute! You look fantastic in the blue and purple. Those colors really bring out your eyes. However, if you don't have to go into the office or dazzle at a party, I love outfit #1 with that sweater and those boots! I like the casual holiday look. Most of Christmas parties are pretty casual. I love the Loft. It has been one of my favorite stores for a long time now. Thanks for reviewing. My favorite is outfit #1. It's cute, trendy and something that can be worn to many different outings. I love them all! But I love outfit # 1- so cozy! I love the purple of the dress in #3 too :) And there is a coat at LOFT I asked for for Christmas! Office to party! I LOVE Ann Taylor Loft and have for years. As a working girl - not the Pretty Woman kind - I always end up out to dinner or drinks in my work clothes b/c I never have time to go home and change. Love it!! I was excited to see you review The Loft - it is a great store! I love to shop there when I get the chance. My favorite look of the three is the "Casual Holiday" I am a stay-at-home mom of multiples as well, so this would fit me the best in my current lifestyle. I love how it looks so put together and classy, yet comfortable and laid back as well. It is perfect! I love the casual Holiday Look #1. It looks warm and comfy especially when running after kids and still dressy enough to wear everywhere Christmas Eve/day. I've never shopped at Loft before, but now I have to check it out! Office to Party is super cute. I LOVE the Loft! It really is my favorite store to shop too! :) I am all about comfort, but I'm also SUPER girly, so I think my favorite is the "Perfect Party Look"! It's hard to resist something in a girly color with some ruffles! I always think that is the hardest look to pull off, and I feel like I am always running somewhere after work and don't quite love my outfit. Outfit #1....LOVE LOVE LOVE IT! Thank you so much for blogging about this! There is a LOFT here and I haven't set foot in the store yet. I am one of those people who is reluctant to change my shopping habits but I think after seeing your blog (with the pictures!) I can't resist this new shopping adventure! I simply MUST get that grey sweater and I saw the pics of the purple dress...I am wondering if they have something special for me to wear to Steve's company Christmas party! I have been having such a hard time shopping for myself lately but I will be at LOFT this weekend for sure! THANK YOU SO MUCH FOR POSTING!!!! I'll let you know on Facebook what I find this weekend at LOFT! I LOVE outfit #1 (the casual look). The sweater coat is ADORABLE!!!! i love outfit number 2! thanks so much for sharing! Love the casual outfit...I am going to buy that sweater today! I doubt that I will go with the skinny jean, but you have peaked my interest to try on a few pair of the boot cut! Outfit #3 - perfect party - definitely perfect! Love the loft...and would love a $200 GC to splurge after our first kiddo is born at the end of January! Love the Office Party Outfit! You can wear that anywhere, and look cute, but not over done! Gonna go check out Loft for some holiday outfits! I like the office to party look because that is EXACTLY what I need for the holiday season!! I will be using their coupon and visiting one of their stores very soon!! Thanks! I love #1, the Casual Holiday look! We recently moved to NW Arkansas from Dallas and I left my career in advertising and am now staying home. It's great to see how to put together a cute, casual everyday outfit. I feel like I only have "work" clothes and "work-out" clothes --- nothing in between! Thanks so much for the informative post! My favorite's the office to party look, too! I'm all over wool pants, 'cause they look classy but stylish, and the purple top is beautiful! OOPS I forgot to leave my email address. I like Outfit #3 - Perfect Party, but you look great in all three of them! Love them all...so hard to choose. I say #2. LOVE IT ALL! Going to barrow the gray sweater for sure!!!! Maybe even the skinny jeans and necklace!! Watch out Suz's closet!! My FAVORITE LOOK? The perfect party dress of course.. you look DARLING! It's so girly and sweet. I love it. As for the other looks.. well, SMOKING HOT AS ALWAYS!!!! I love you so much!! Outfit #1 for sure!! Looks so cozy and warm... too cute! The popular choice seems to be outfit #2, and I have to agree! It's practical and looks absolutely adorable on you! I love look #1! The sweater jacket is fabulous! I've never been to LOFT, but after reading this I will check it out! I like the Perfect Party look (#3)! I like the office to party look...FABULOUS! I love look #1, especially that sweater!!! I am going the the Loft for a new pair of jeans! I like the casual holiday. It looks like something I could wear every day at home with kids and still feel good about myself if I run errands or end up going out--like that ever happens! I LOVE the Loft. I've got some great stuff before from the store. Love your 'business' outfit the best! I LOVE the 2nd outfit- office to party. You look great in all of the cute outfits! Wow, I just love the casual holiday look! So classy! I love Loft's shirts though have had trouble finding the right fit of jeans, maybe I should try again! I love look number 1, but they are all cute! I like the office to party look!! I like the perfect party look the best. You look fantastic! Perfect Party. LOVE the dress. Super cute. I'm a big fan of LOFT. It's really wonderful. And, one of my coworkers is a bargain shopper and ONLY wears LOFT clothes. Seriously. But she comes in and everyone raves about her outfits and then she says she got them at the LOFT and gives us a breakdown of cost. It's insane what good sales they have!! I love #1 - casual holiday. So perfect for winter days at the mall with the littles. I love LOFT... there is one in my local mall, but I have never tried their denim. You've inspired me! Yea for Loft! Love the 2nd outfit. Looks perfect! Outfit #1 is me! I love the casual look! I love the perfect party look! I love dressing up and always have such a hard time finding clothes that aren't under my age but are also HOT! Thanks for the review, I'll have to stop at the LOFT next time I'm at the mall! I LOVE casual holiday! So Great! I love the casual holiday look!! Fabulous. I loved the office to party look! So cute! I LOVE LOFT! I had never shopped there before, and I went in looking for an Easter dress and fell in love. They have such cute work & casual clothes, and really cute accessories. Anyway, I am a sucker for a sweater coat and a lovely cocktail dress, but my favorite look has to be #2!! I just love the layers and the different colors. I need to remember that outfit when I shop! My favorite is def the office to party!!!! But of course you look great in all of them!!! My favorite is Casual Holiday #1! I do love all of the looks! Ann Taylor Loft is the best! You look wonderful! Love the office to party look! And the Loft has been my favorite since I discovered several years back! I've gotten a cashmere sweater for $9 from the clearance rack, and I don't think I've bought works pants anywhere else. I love the office to party look! My fave is office to party. But they're ALL so cute! The LOFT is my favorite store! You look FABULOUS in that dress!!!!! How much fun!! You look great!! Love the skinny jeans!! I love all the outfits but I would go with outfit #1!! My favorite is the Casual Holiday. This store is my very favorite! I loooove the office to party look!!! But all outfits look great on you!! I like the Office to Party look! I love the first look...casual holiday. That is so me...very comfy, but still stylish! I have never shopped (or gone in) a LOFT, but am certainly going to try it out!!! Thanks! I like the perfect party dress, but I would probably get more use out of the office to party look! Outfit 1 looks so versatile and comfy!! Definitely my favorite! #3 was my favorite. you looked amazing! My fave is the Outfit 2. I am a working girl so I have to go to events after work and don't have time to change. I would love to have an outfit like that for those days. LOFT is my FAVORITE store!! I am petite and can never find jeans to fit me. At LOFT I can literally go to the rack, pick up my size, buy them and not even have to worry about trying them on because I KNOW they will fit. I can't do that at any other store!! Outfit 2 is my favorite. Love love love outfit 3!!! So cute! My vote is for the office to party look - love it. As an aside I purchased clothing form the Loft during my engagement 10 years ago and those are still some of my favorite clothes. They all look just as great and have maintained their appearance even after all of these years. As usual you look gorgeous Suz! I like the outfit # 2 office party look. I have never been to the LOFT store before, but I sure will be stopping by there now! Thanks! Loved the Party outfit. I love purple! #1 Casual Holiday...those pieces can be paired with so many different things for different looks!!!! Loved the review, love the clothes, and I would love to win the gift certificate to get a few pieces for myself! Oh...LOVE all three outfits. You can't go wrong at LOFT. I love the casual holiday look, the sweater is super cute! I love the perfect party look. The purple is fun and not typical. I love the outfit #2 (office to party)!!! "Oh what FUN" it must be to shop with a stylist! I like them all....but #1 is my favorite! I Loved the purple dress... you look killer in eggplant! Who would EVER think you were once pregnant with Quads! Would lvoe to win this gift card too! I love the first casual look!!!! Its the perfect "im a mom but I can still dress trendy" look! I'm a 28 yr old mother of 3 so I totally get that feeling of being stuck in the middle! You looked great in all the looks but my favorite was the office to party. As a working professional that look as wonderful - now if only I could fit into that size 6! I will be stopping the loft soon! The office to party look is my favorite - can totally see myself wearing this. I also LOVE Loft and their denim fits me perfectly too! I like the casual look! Outfit one is right up my alley! I can't believe you just discovered this store either! Although, I will say that in the past year, they have really kicked it up a notch - they have totally become my go-to store for cute and comfy work dresses and skirts. My favorite look is the Casual Holiday look - what can I say, I'm a sucker for a thick sweater coat! i love the casual #1 - looks cute and comfy! I like outfit #2, office-to-party. I can totally see myself wearing something like that. Comfortable yet classy! My favorite is the office party. I have to say I LOVE the Loft. I am a 26 year old professional who is short, so it is VERY hard to find clothes that fit me and my age for work. I LOVE the 2nd outfit! LOVE the jacket!!! Beautiful! LOFT is my favorite store as well. I can always find something there! CUTE, CUTE, CUTE!!!! I LOVE the purple dress...so wish I had found this last week for my hubby's company party. I think the sweater coat might be a close second for me though... I love the LOFT though.... how have I not made it in this season? I really like your office-to-party look!! I love the fun color combonations!! I love the office to party look because I, too, am a sucker for a good necklace and it just all works so well. Of course, you're one hot mama so they all look great but #2 was my fav. I really liked the office to party look. Ann Taylog LOFT is my fav store!!!! Found it after I became a mom :-) Love everything in the store and have even walked out wearing what I purchased one time. I love your casual look, will have to go check out our Loft to get something cute too!! Love this review!!! Love these looks & love loft!! I love all three looks... but number 1 was my favorite... I love the casual look but it is still so pulled together. #2- love it! And it would fit my lifestyle perfectly. Office to party- definitely my favorite! Outfit #2! Of course, you look cute in anything! Love Look #3!! That dress is gorgeous! Oh my gosh I love ALL of the outfits! I guess I'd have to say I like the work one the best, though. So cute!! I hope I will the gift card...LOFT is my favorite store!! Suz!! LOVE the outfits! I'd say my favorite one is the Outfit #2 for the Office Party. I'm with you and love the contrast of blue and Magenta! Love your casual look & love LOFT (have for a long time!). I like the office to party outfit the best as well. I tend to have plenty of dressy and plenty of casual and nothing in the middle!! Love the Loft!! I love outfit #2. Great combo. I think outfit #2 is my favorite! LOFT has been my favorite store ever since I moved to Chicago eight years ago. It's the best! I love, love, love outfit #2!!! So versatile - you could mix and match any of those pieces with items in your own closet and make several outfits out of it! I love the casual party outfit!!! You look amazing!!! My favorite outfit is the causual holiday. I am always trying to find something "special" to wear on Thanksgiving and Christmas, but also comfortable (there will be kids running around! ), washable (again, those kids! ), and something that really looks like "me" - this is it! I LOVE #3. That dress is a gorgeous color and I love the necklace you paired with it as well! All of the looks are fabulous. I love Outfit #1-Casual Holiday! So cute! I love your outfit #2! I work in an office and have to "dress up" daily so that look would work perfect for me! Thanks for the giveaway...Merry Christmas! I like outfit #2!! Totally love the Loft!!!! I love the office to party look - very versatile. I shop at Ann Taylor and the Loft quite a bit. I Loved the casual holiday #1. With 3 little ones I thought it would fit my life perfectly and not look like the traditional sweats :) Thanks for reviewing! I love outfit number 1! Office to party is waaaaay cute ! Seriously, how I am supposed to choose just one. I will go with Outfit #1 since I'm a stay at home mom and absolutely love the sweater. I had all the preconceived notions regarding the store as you and now I can't wait to try it out for myself. LOVE the #3 party outfit! You look smokin'! I also love AT Loft!! I love the casual holiday look. Something I would absolutely wear and be warm and comfy! You look stunning in each outfit, but #3 is my fav..I wanna be you! I love the office to party look! It is great layering, and looks great all together! I am petite and love the look that LOFT gives even to my size! The office to party look is my favorite! Although I do love the skinny jeans/boot pulled over look... I just don't think I can pull it off. I found your blog a while back, and just had to post on this review. When i saw your pictures i just knew you had been to the Loft, i can spot their clothes anywhere. I love outfit #2, would be perfect for my business casual setting at work. I totally agree on all that you wrote about the Loft, from how the sizes fit true, to having plenty to offer for those in the "in between" stage of life. I always had trouble finding pants that fit and were not too long, as I am pretty short and petite. After someone suggested the Loft, I went to check it out and never looked back. The pants are always true to size and fit perfectly, no hemming needed! The petite section is perfect for me! Not to mention that all of their clothes are so cute and affordable with their ongoing sales. I love outfit 1! It is a great cute outfit that can be worn many places! It loooks comfortalbe also, and that sweater could be worn with leggings. Very cute! Love love love the office to party look. so classy and chic! You look amazing. First, I so love Ann Taylor Loft! My favorite look is the office to party!!!! Love the dress, but #2 is my favorite! Office to party was my favorite, I love that blazer! My most favorite item that you got though was the blue cardigan, be still my heart. I like choice number 2 the office party look! ooooo! i love the #3 outfit! you are so precious! what a great give a way!!! I love Loft! I shop there all the time because I love their petite section. All the looks are great, but I love #2 the best!